Social media can only do so much to bring in customers, but keeping them attentive to your business is even more essential. This can be done by creating mailing lists and keeping people up to date with special offers and the goings on within your business. Creating a mailing list takes time and patience as well as some nifty sign up forms. 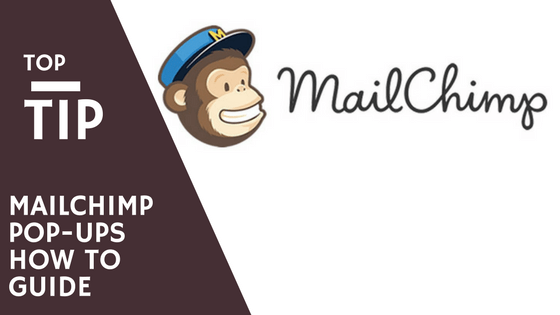 In this help sheet we look at making a pop up form through MailChimp that can be placed on your website every time someone visits your webpage. Select Sign up forms from the options given and then select which type of sign up form you require. We will be looking at the pop up sign up form so please select this one. Now you get the MailChimp design screen as seen below. You get four choices when creating a pop up form – Just text, text and a top banner, text and a right picture or text and a left picture. You can also change the font style and colour, Button text, colour and layout as well as the ‘X’ close button in the corner. You can add fields such as First Name and Last Name using the Fields tab at the top. Add a picture and any additional text using the Content Tab. Settings tab allows you to decide how long a person needs to be on your page before the sign up form pops up and how wide the form needs to be. Always preview the form as you make changes to make sure it fits your preferences – This is done by clicking on Pop Up Preview in the top right corner, just click the ‘X’ in the corner to close this down, hitting the back button takes you back to MailChimp’s Sign Up form page not your designing page. Once satisfied with your form, click generate code. This will then provide you with a pop up filled with text – HTML coding to be precise. Copy and paste the text. Access your WordPress site, and select either your main page or a post in which you want the sign up form to appear on. On the editor screen select the text tab at the right top corner of the text box. At the bottom of the text box paste the code you copied earlier from MailChimp. Save/update the page/post and view it. Now after the designated time you should see your sign up form pop up. If you have any issues with these instructions or with MailChimp and WordPress do get in touch and I will be more than happy to help. If you want more tips an help sheets sent straight to your inbox why not sign up to your Mailing list?